This card fits perfectly into the Caardvarks challenge going on right now. The challenge is using die cuts. I used a Cosmo Cricket die cut from their brand new mitten weather collection. This collection is full of fun colors and embellishments. I am glad I purchased it! Hi, Lori here today. 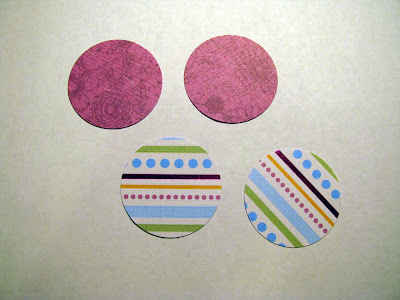 I thought I would share with you how to create a wreath using double-sided tape and glitter. I used antique gold glitter but you could use many different colors. This went together pretty quick. 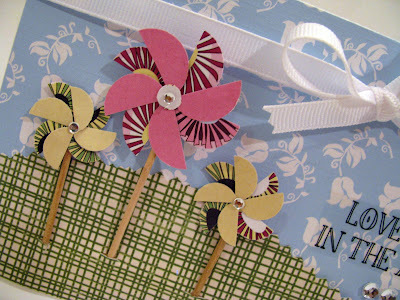 The card could be recreated in about 15 minutes (if you precut the flowers). I'm looking forward to Black Friday! Is anyone else? My girls and I started going 3-4 years ago. They were finally old enough to go out they early in all the hustle and bustle. Truthfully, I don't usually shop for Christmas gifts that day. I just enjoy the fun of getting out and about with everyone else all decked out in their Christmas attire and spreading the Christmas spirit. I forgot to add it to the tut. 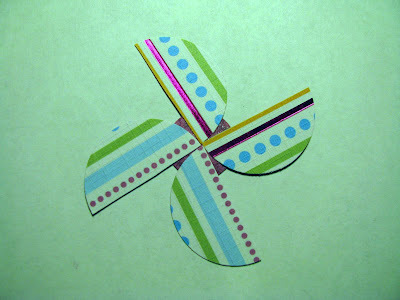 To make an envelope coordinate with your card. to the enevelope with tape. It is an instant face lift. after. It didn't seem to affect it doing it last. As many of you know, I am expecting our 5th child. As a result I've gotten severely behind on posting my DT projects. This month I'm planning on posting at least two projects a week in hopes of "getting caught up". 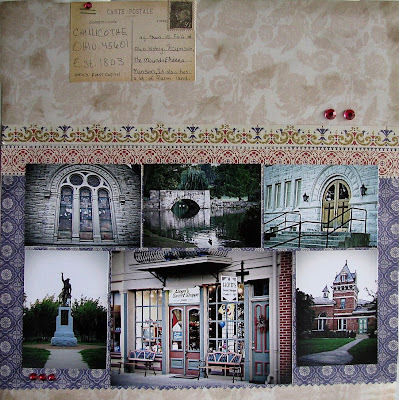 I have a couple Nikki Sivils projects to share with you today. I enjoy creating with Nikki's fun and cute collections. loaves I baked using a small piece of the patterned paper. and a Tree Love tag. The holidays are here!!!! Well, almost....I have been looking forward to them since Fall began. I can't wait to start listening to Christmas music while the scents of the season float through the house. My oil burner runs 24/7 and I have some yummy Christmas smells to add to it. What is your favorite scent of the season? This month is the time we start thinking about gifts for family, teachers, co-workers, mail carriers, neighbors etc. So I put together this little candle in a jar. 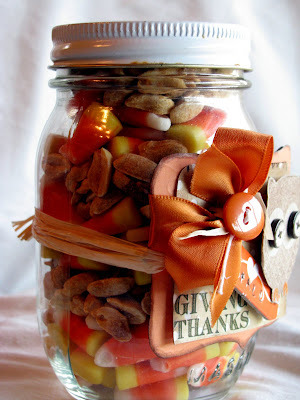 What a quick, easy and inexpensive gift to give. I will probably give these to the personnel at the school this year. Candles are usually well loved and fun to receive. I know I enjoy getting them as gifts!! Hi y'all! 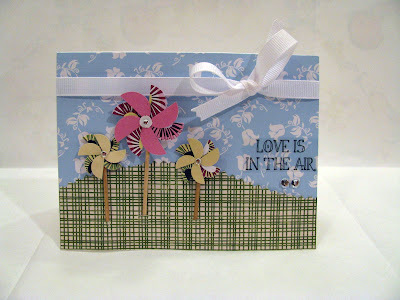 Lori Here......Since I have never used flocking before. For my technique I decided to flock a gcd Studios chip board piece. The piece I used is bird that was easily turned into a raven. Flocking is a very simple ans easy technique. I will definitely be doing it again. I started out with this Christmas frame. I used stazon and a black sharpie to color the wood frame. created. I used my heat gun to speed up the drying process. on glue. It seemed to work well and gave an even coat. velvet too. It gives the bird a nice texture. This month for Gcd Studios we were challenged to decorate one of their chip board tags in a Fall theme. I decided to tie the tag I made to a mason jar filled with candy corn and peanuts. YUM! They are the perfect snack. I'm planning on giving each of the children's teachers one too. 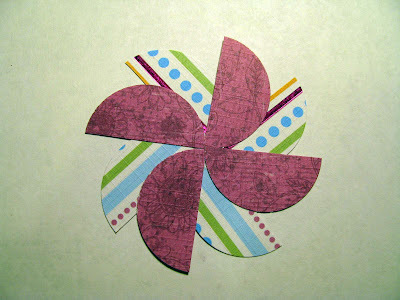 I used papers from the Independence and Sunny days collection. Chip Art tool to deboss the word FALL. I hope you all are enjoying Fall. It is such a beautiful time of year! Wow! It's hard to believe Fall is almost here. The kids have been back in school for several weeks, the air is turning cool and the urge to bake pumpkin-y treats is undeniable. Fall is my favorite season!! What's yours? 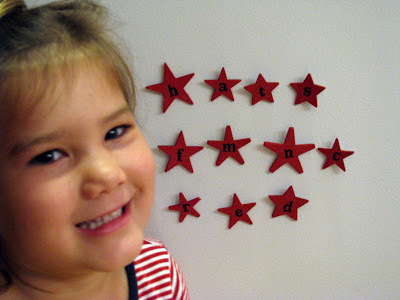 "Make a Word " using magnet letters is very educational. I came up with this fun idea for my 5 yr. old daughter using the star, Chip Art shapes and the peacock, ornamental letter stamps. She loves learning and I'm always looking for fun, innovative ways to keep her interested. Note to self: Make the letter "O". 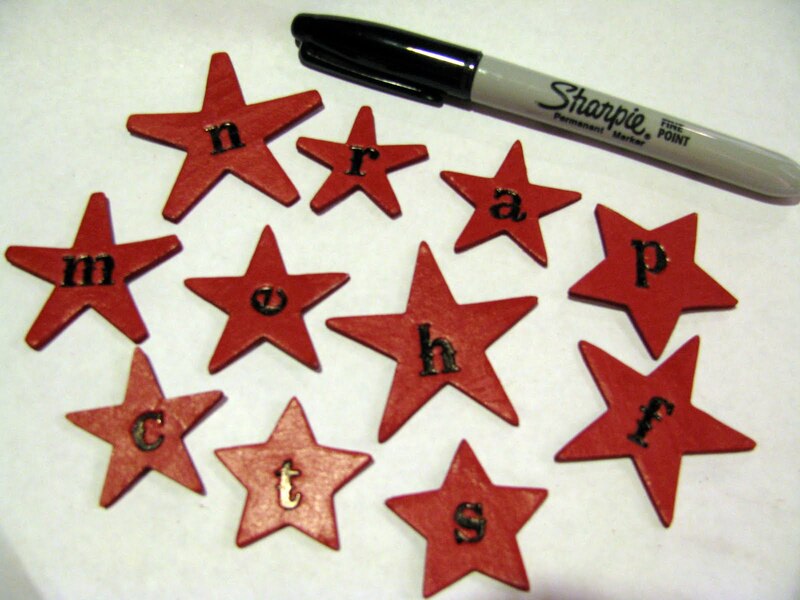 Start out with stars in various sizes. 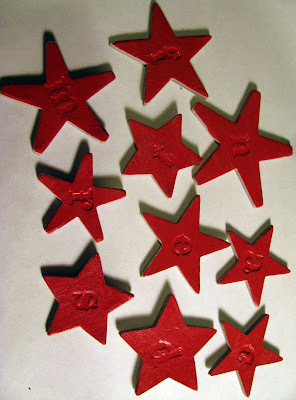 Deboss the letters into the stars. Paint the shapes with acrylic paint. Once dry. Color the letters in with a fine tip, Sharpie. 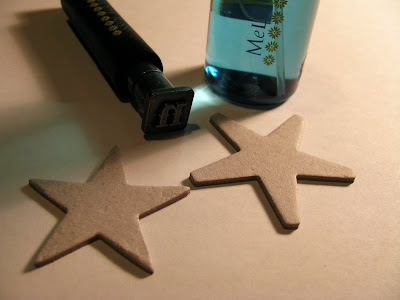 Glue a small magnet to the back of each star. Now they are ready to play "make a word". Hi! Lori here. 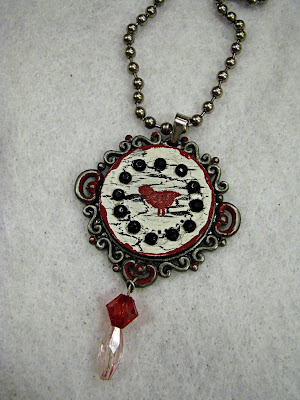 This month we were challenged at gcd Studios to create some type or jewelry. 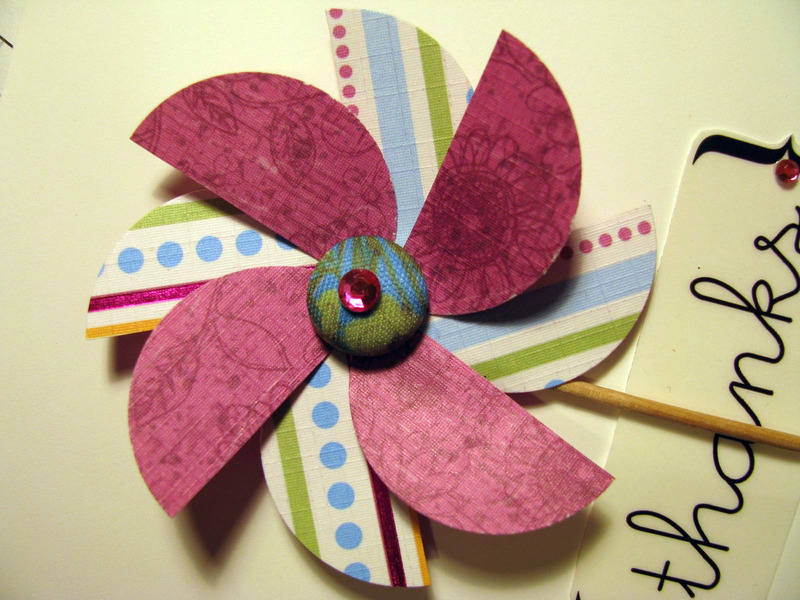 We could make pins, necklaces, bracelets, hair accessories etc. I chose to make hair accessories. As a mom of three girls. I know you can never seem to have enough of them. 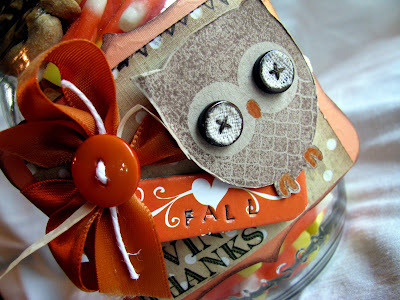 Today I have a cute little tin to share with you. 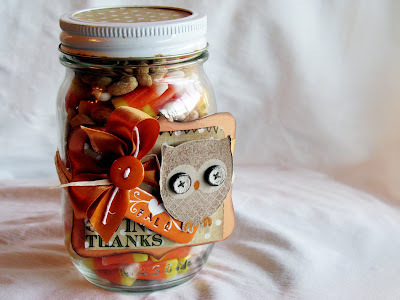 I had the tin in my stash but you may be able to purchase something similar from Papertrey Ink or Stampin' UP. Your local craft store may even carry them. 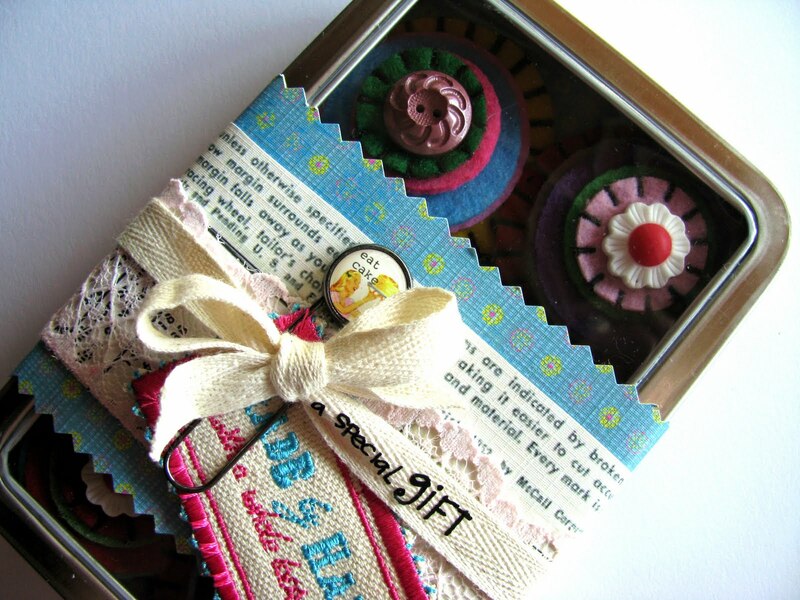 This would make a perfect gift for a little girl's birthday or special occasion. All the supplies are from the Homespun Chic collection minus the rub-on and twill ribbon. 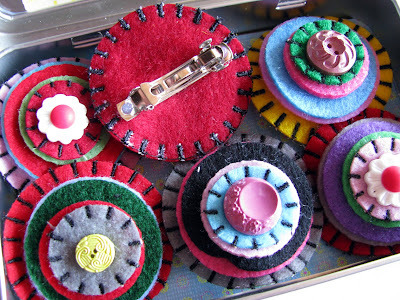 To make these I simply took these pre-made, Homespun Chic felt embellishments (scroll down, photo is on the bottom right) and hot glued hair clips to the back of them. There are six in each pack so you get a lot of variety. 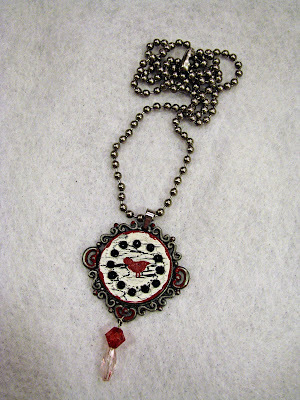 Gcd Studios make these cute little necklaces to coordinate with the Chip Art tool. I created a crackle finish on mine. I added some bling and distressed the edges with some paint. They are fun and easy to create. 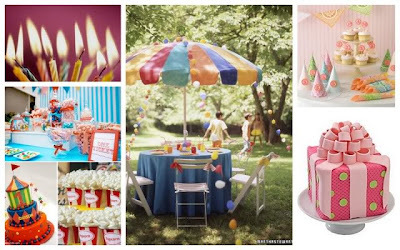 They would be perfect birthday party projects. 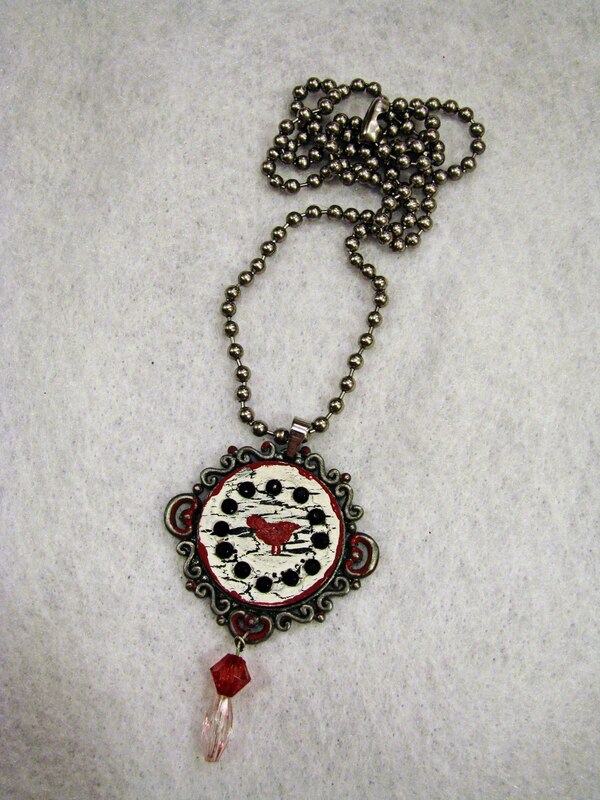 Please Hop over here to see Heidi Sonbouls cute necklace. I've been wanting to participate in an Embellish challenge for a long time. So, I was happy to sit down and create this card for the current challenge. The colors are so soft and lovely. They went along perfectly with the October Afternoon Thrift Shop cardstock stickers I recently purchased. Sorry for the lack of chat but I must run....have a super special day! To be completely honest. Pinwheels were always a challenge for me. I would look at them and feel quite confused at the way the blades laid. For some reason my brain just couldn't "go there". I saw some of these browsing the net this week and I knew I wanted to figure out how to make them. 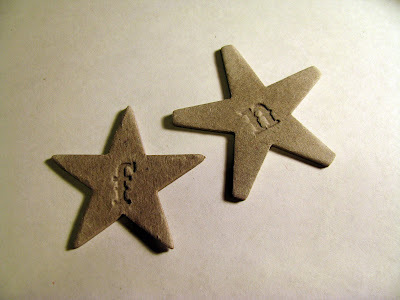 They turned out to be very quick and easy to create. They can be created in less than 5 minutes. I think I'm going to making a lot of these in the near future! Punch 4 circle of the same size. Cut each circle in half. You will have 8 halves. Punch a smaller circle and cove with adhesive. Lay 4 halves evenly on circle. Now you all know I'm a little rusty in the SB area. I gave it up for cards and altered projects. That means a challenge like this really stretches my comfort zone. Which is a good thing!! 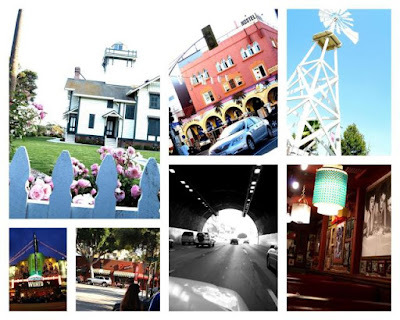 Anywho......This month we were challenged to create a l/o using photos of our town. This is what I came up with using the Independence collection. I kept my l/o very simple so the photos would be the main focus. Our town is the first capital of Ohio. 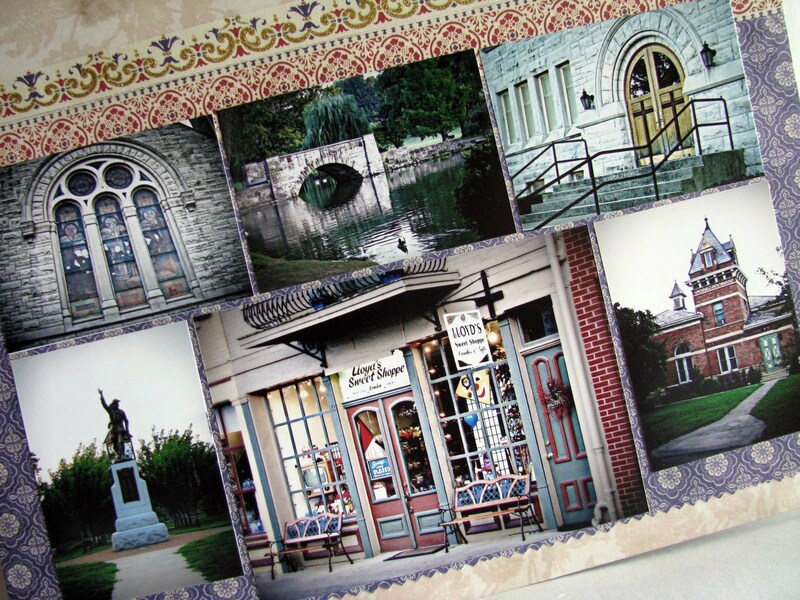 We celebrated 200 years in 2003. 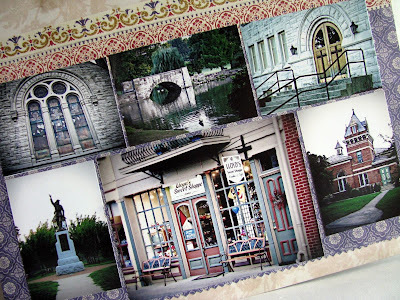 Chillicothe holds a lot of Ohio history. With farming still being a fairly big industry. PLEASE go here to see how you can be eligible to win the new ChipArt Tool from GCD studios. Hi, it's Lori here with you today. I hope your week is going along smoothly! We've been enjoying the lazy summer days. How about you? This month's theme was parties. 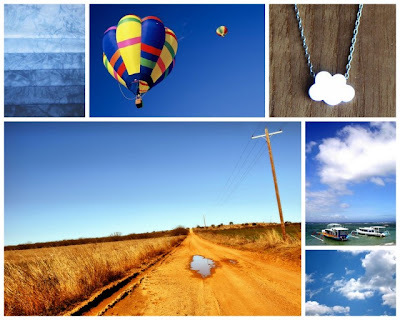 The photos Heidi S. put together are amazing! I was not at a loss for inspiration. I love girly styles and colors so it's no surprise that the top right photo stood out to me. The colors of the cupcakes, party hats, and banner in the photo work perfectly with the Homespun chic collection. 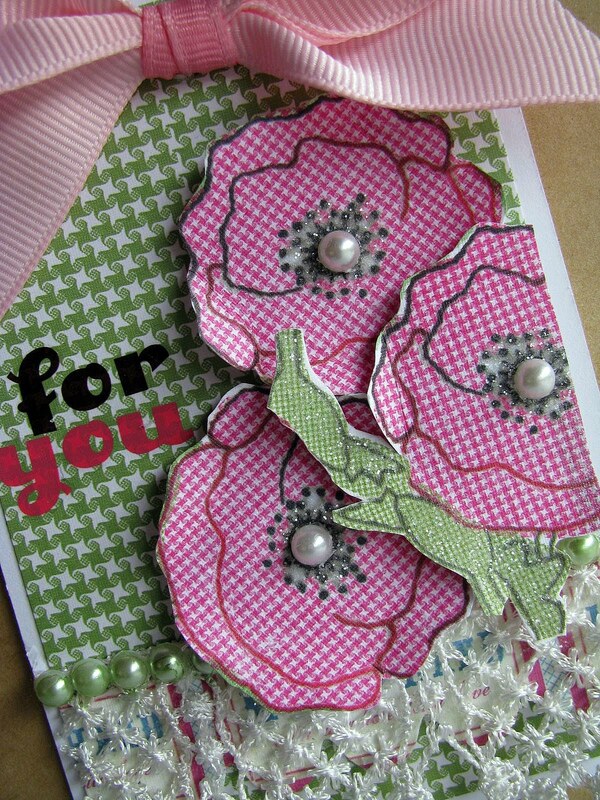 The shades of pinks and greens are perfectly scrumptious. I always need birthday cards so this card and gift bag combo will come in handy. Here's a close up of some of the detail. 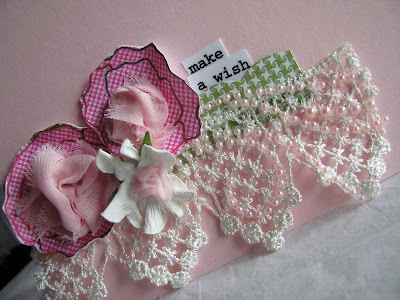 Scallops, fabric, lace, and pearls are the perfect vintage touches. The bag only cost around .33 cents at Hobby Lobby. So this gift bag is a very inexpensive gift wrap. I started out making a tag but in the end I decided to add it to the front of the bag instead of hanging it from a handle. 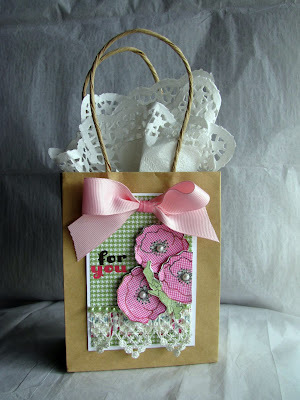 I used Homespun Chic paper and borders to create the card and decorate the bag. I REALLY love that collection! It is one of my absolute faves!!!!! I'm excited to bring you my technique today. I guess you could say I was inspired by the bright and shiny necklace in the photo. And of course, I can't leave out the vibrant blue skies. A light bulb came on when I was digging out possibilities for this month's challenge. 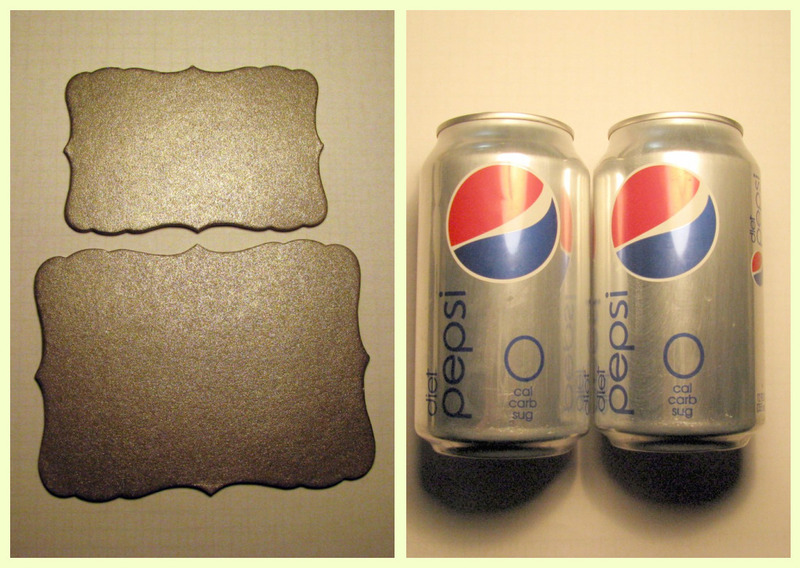 I believe I was working on another project and had these two pieces of chipboard laying out on the table. For some reason they caught my eye and all I could see using them for was a robot. I could just envision his cute little boxy face. Almost immediately I went to work spray painting the little dude. After mulling the idea around for a bit. I started thinking of supplies I already had on hand that I could use. Like pop cans. I washed a couple out before bed that night so they could be drying. Then the idea to use hardware came into play. So I dug around and found some in a kitchen drawer. All I had to do was dab some acrylic paint on them with tiny piece of a sponge. 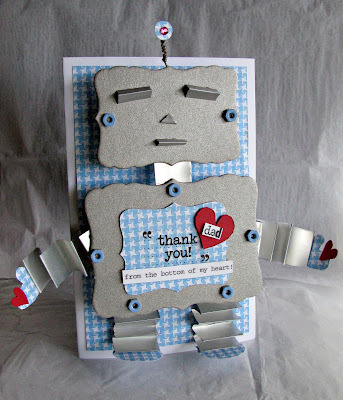 Without further ado....Meet Ramsey the robot. I think he's such a cutie! He was so much fun to create. Hmmmm, maybe he needs a Mrs.? Cut two 1 in. strips from one can for legs. 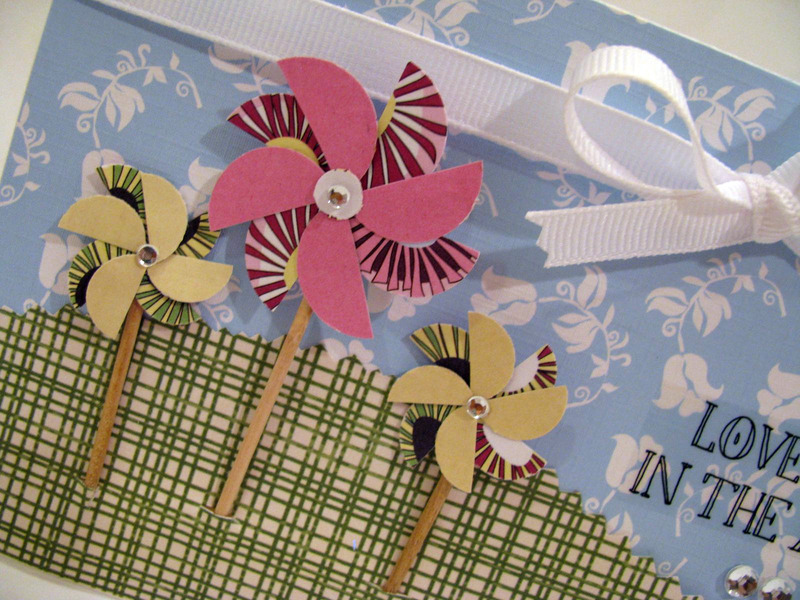 Accordion fold and adhere. Cut two 3/4 in. 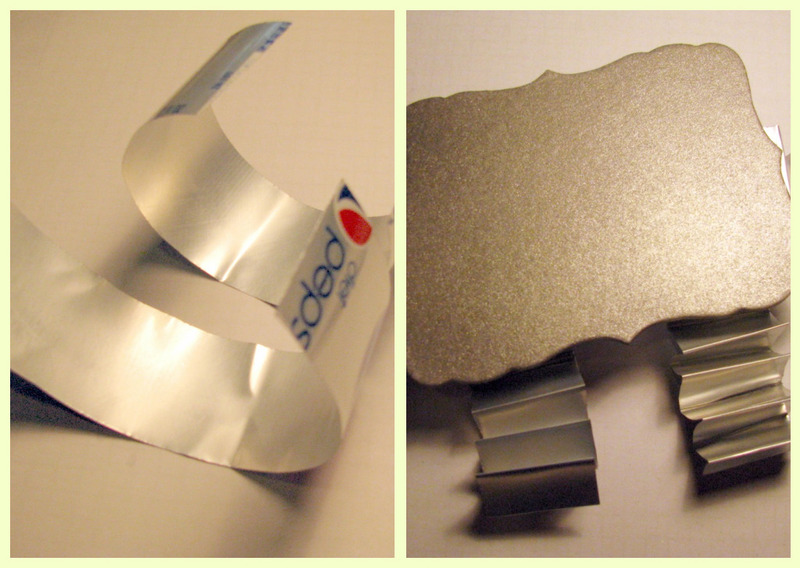 strips from 2nd can for arms. 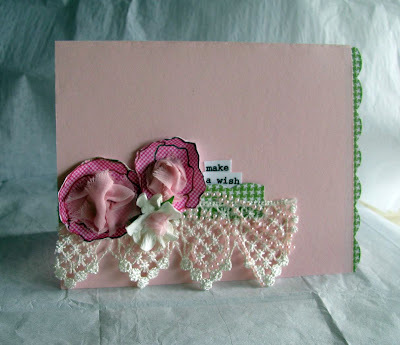 Accordion fold and adhere. Create two rectangles from a piece of scrap aluminum. One will be cut for the eyes. The other will remain uncut for the neck. out of scrap aluminum. Fold to create a triangle for nose. 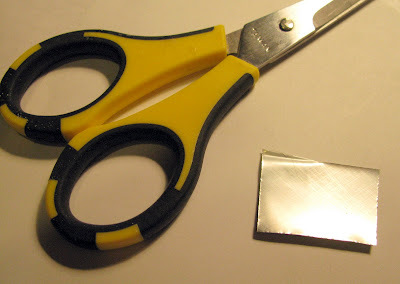 Also cut small rectangle for mouth. Wrap wire around end of paint brush to create antennae. 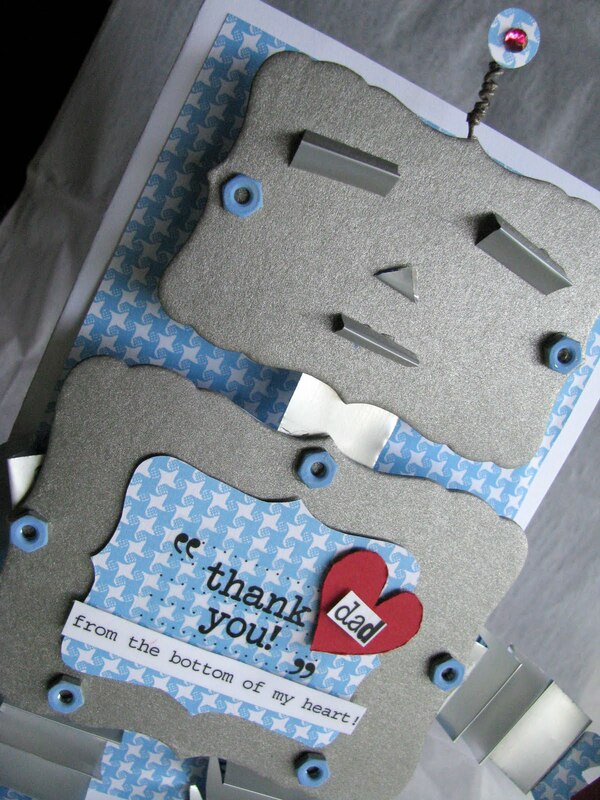 accordion fold arms and legs. adhere. cut neck from scrap. adhere to head and body to connect. create eyes, nose and mouth. adhere. paint nuts. allow to dry approx. 15 min. once dry adhere. trace and cut middle panel. hand draw hearts, hands and feet. cut and adhere. affix stickers to card stock. cut and adhere. 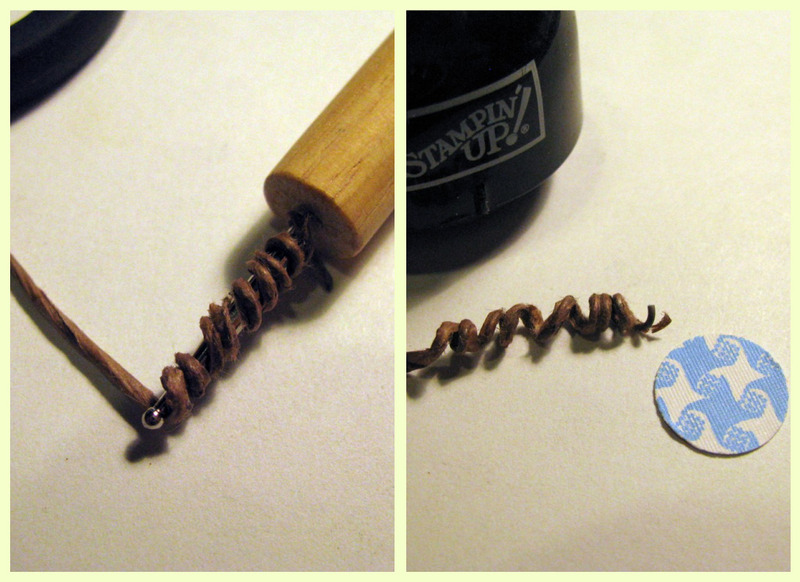 wrap wire around paintbrush. remove. punch out circle affix rhinestone. adhere to wire. adhere wire to robot. 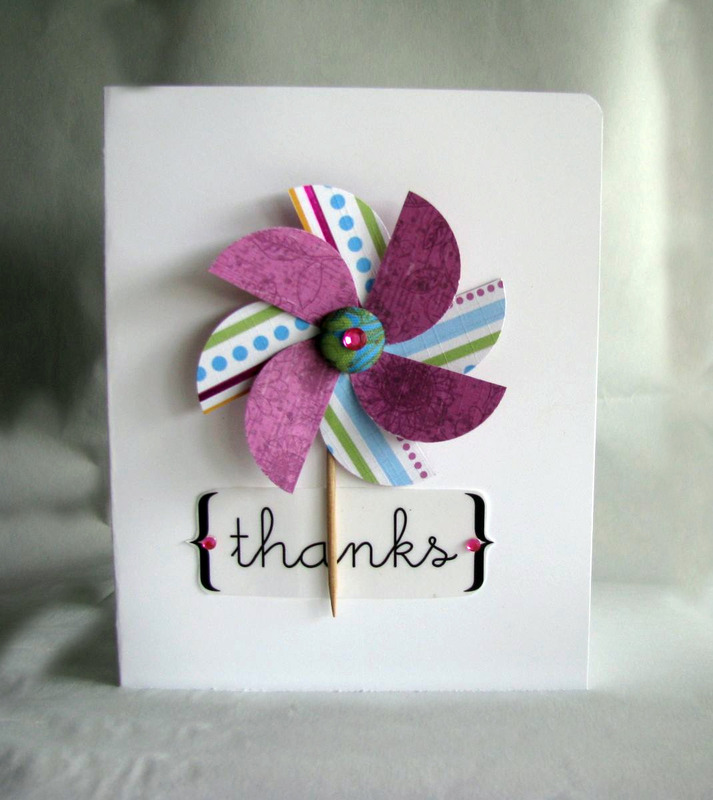 cut card stock to create card base. 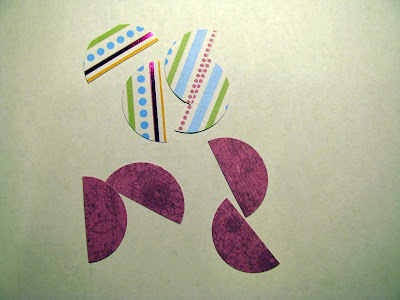 cut patterned paper slightly smaller than card stock and adhere. 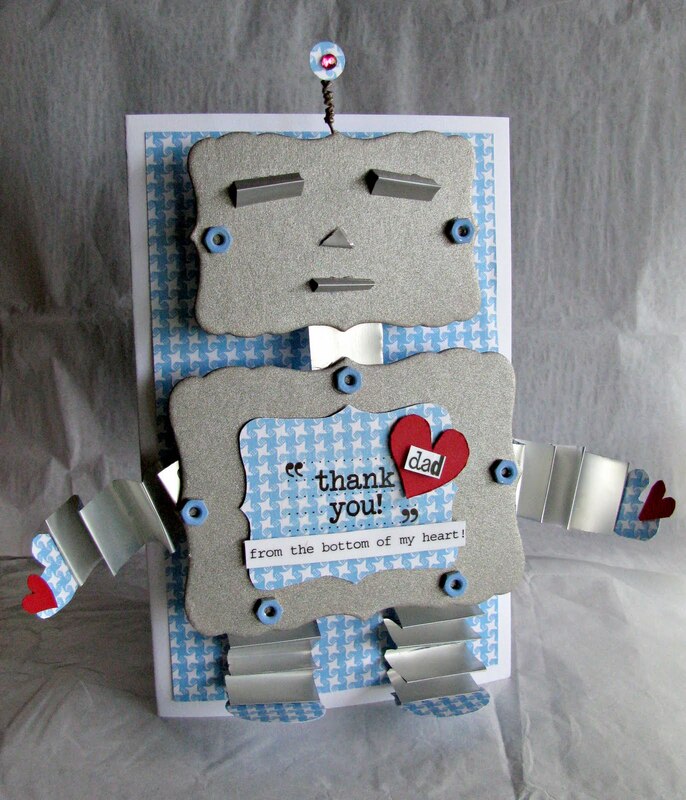 Adhere robot to card base using foam tape.